RT MediaMogul - beautiful and simple template for sites controlled by CMS Joomla 1.5 and 2.5 from the studio RocketTheme. 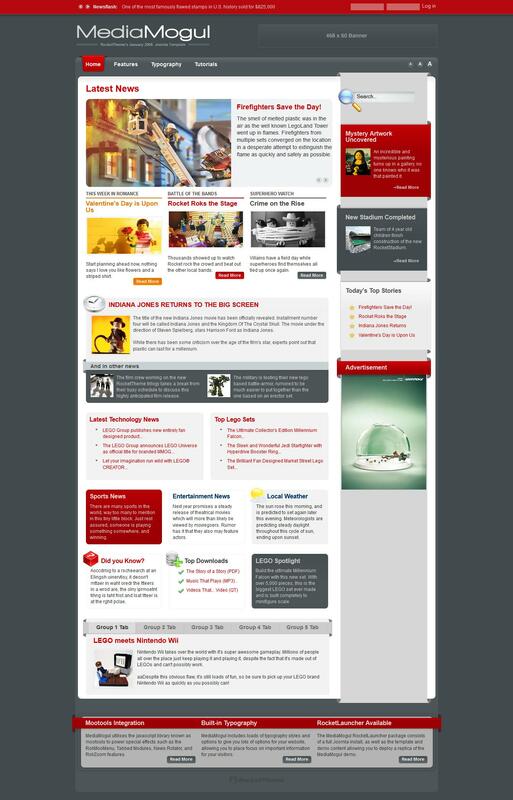 RT MediaMogul template is versatile and suitable for sites of different subjects, especially for large portal projects. The template RT MediaMogul 6 preset styles bright exterior design and has 26 positions to accommodate modules. RT MediaMogul template is easily customizable and scalable. Developers do not accidentally adapted for RT MediaMogul such a variety of useful extensions. Template RT MediaMogul designed according standards of HTML and CSS, so that appears correctly in all modern browsers. RT MediaMogul template is a good option for media portals and major websites that require special functionality and ease of maintenance.